Hi my loves! I had a great response from you on Instagram on this outfit so I thought I would do a full post about it and in particular about my love for winter whites. Its something that I keep wearing again and again and I never get bored of it. And when I say white, it can also be cream or beige or anything within that realm. And the top and bottom don’t have to match in terms of colour – I think you can easily wear a pair of white trousers with a cream sweater. What I would say about finishing touches is that metallics go so well with winter whites so always try to incorporate that in the look like I did here with these Stella McCartney shoes which are still one of my favourite pairs. I also always think its nice to mix the textures up a little to separate the bottom part of your outfit with the top. 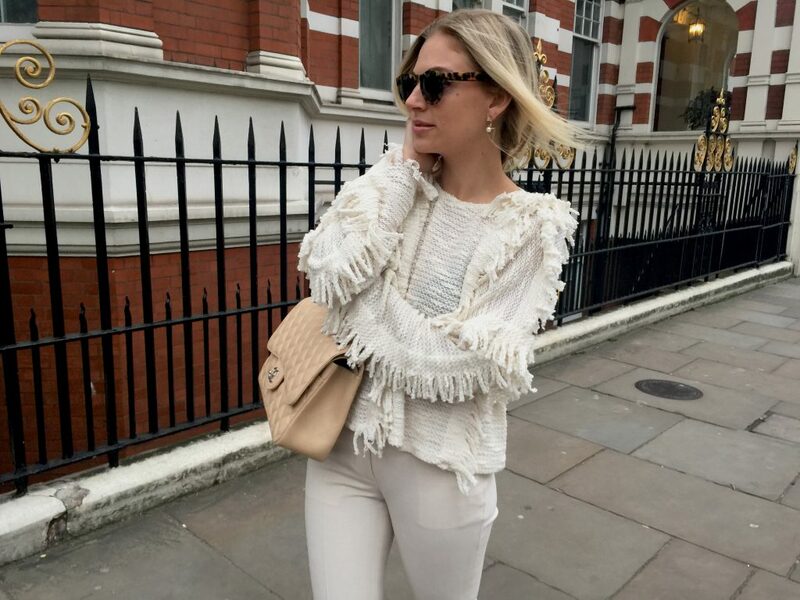 This sweater was a great find from LA label Misa – absolutely adore the fringing on it. Ive put together all my favourite cream/white/beige pieces below – you can mix and match these to create looks! Quite a few of you have been asking me about Mila’s routine so I thought I would do an update on it. It really hasn’t changed much since birth. She wakes up at 06:30 (ok that has changed! she just will not sleep past this time I have tried everything but she is an early bird) and we usually bring her into our bed for cuddles. This is still one of my favourite times of day. She is SO cute in the morning – she gives us kisses and high fives and cuddles and she is so alert and happy and fun. She then has her milk anytime between 6:45 and 7am. At 08:30ish she has her breakfast – luckily she really loves food and is totally not fussy so she eats anything but I usually try to give her either some porridge with fruits or a banana or avocado. I really like to make everything fresh for her – I am sure lots of the ready made sachets like Ella’s kitchen are fine but I think why would you not make everything fresh especially when you are at home? She then has a power nap of 15 minutes at around 09:30 – she still really needs this especially as she gets up so early. After she wakes up from her nap she has her second milk of the day followed by her lunch at around 11:30/12. She has tried most foods by now including fish and chicken and every single vegetable as well as bread which she loves. Its crazy the amount she eats but she will never be a chubby baby. I think its because she is so active. I mean she is ALWAYS on the move. She then goes straight to sleep after lunch and this is when she has her long 2 hour nap. She is quite flexible which is great because it means that if we are going out a bit later I can always delay her nap to 1pm instead of 12 or if she seems really tired for example I can give her a nap at 11:30. We try to find something that suits everyone but of course she always comes first and we plan around her. People often ask how she sleeps so well when we are out and the key is getting her to fall asleep before we go out. Because if we are already in a restaurant and she isn’t sleeping, she is so stimulated by everything around her that there is absolutely no way she is going to fall asleep. Sometimes she sleeps a bit less say 1.5 hours as opposed to 2 but in general she really needs this and is good about taking it (unless we are on holiday in which case her routine always seems to get broken up. She didn’t sleep at all on one of the days in Ibiza but then I just put her to bed earlier to make sure she doesn’t get too tired.) When she wakes up from her nap she has her second lunch of the day and a little later has her third milk of the day. I also try to always give her a little bit of fruit after a savoury meal so she gets used to having a main and desert. And she always has water with her meals as she gets thirsty – who wouldn’t want to drink something with their food! I still give her sterilised water – I’m not actually sure when you can start giving them regular water but I am so used to doing this now its not a big deal. She then may or may not have a small snack at around 4 depending on how hungry she is but her main tea time is at 5:30. She has a bath at 6:45 after which I always read a book to her while she has her bedtime milk and she usually nods off between 7:15 and 7:30. She is really good about going to bed but again being on holiday can always upset the schedule a bit and it can take a bit longer. But then you just adapt according to her needs. So thats it really. Think I have covered it all but let me know if you have any questions. All I can say to mothers with younger babies or those that aren’t sleeping through the night is that the nighttime wakeup’s now feel like a distant memory and all babies will eventually sleep through. So just be patient. Or get a sleep trainer!